World Jewish Congress CEO Robert Singer was in Berlin this week for talks for senior German government officials and others. 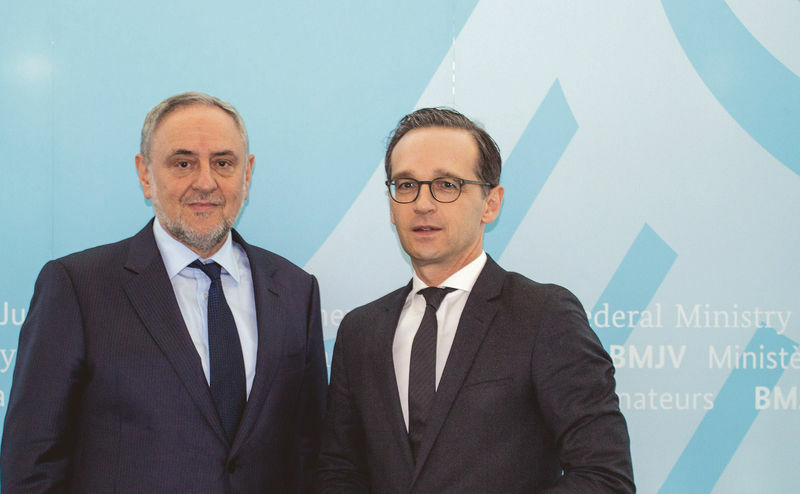 Singer met with German Justice Minister Heiko Maas and his deputy Christian Lange to discuss measures to curb the spread of hate speech, Holocaust denial and anti-Semitic incitement on the internet. Maas indicated that he was prepared to act through legislation if the problem was not contained effectively. The WJC delegation, which included WJC Deputy CEO for Diplomacy Maram Stern, also met with representatives of Facebook to learn about the company’s efforts in fighting fake news, hate speech and incitement on its social media platform. A meeting with Germany’s former President Christian Wulff on Wednesday focused on the rise of far-right parties in Germany and Europe, the fight against anti-Semitism and other forms of hate, the integration of refugees and migrants, and the fight against incitement and hate speech. Both Wulff and Singer stressed the positive aspects of diversity. On Monday, the WJC delegation met with Berlin’s Governing Mayor, Michael Müller, and his State Secretary Sawsan Chebli, who is in charge of integration. Meetings were also held with members of the Bundestag, Germany’s legislature, with journalists and with the heads of major foundations in Germany.